Audio Technica has been a leader in the professional audio world for some time now, but over the past few years it has been establishing itself as a leader in the consumer space too. It’s latest entry into its lineup of consumer headphones are the Audio Technica ATH-S200BT headphones, which come in at under $70, and could be one of the better options for those looking for great headphones at a low price. But is Audio Technica sacrificing too much to meet a certain price point? Or do these headphones offer the quality Audio Technica is known for? We put the Audio Technica ATH-S200BT headphones to the test to find out. When you first take the Audio Technica ATH-S200BT headphones out of the box, you’ll notice that they really look like Audio Technica headphones, even at this price point. 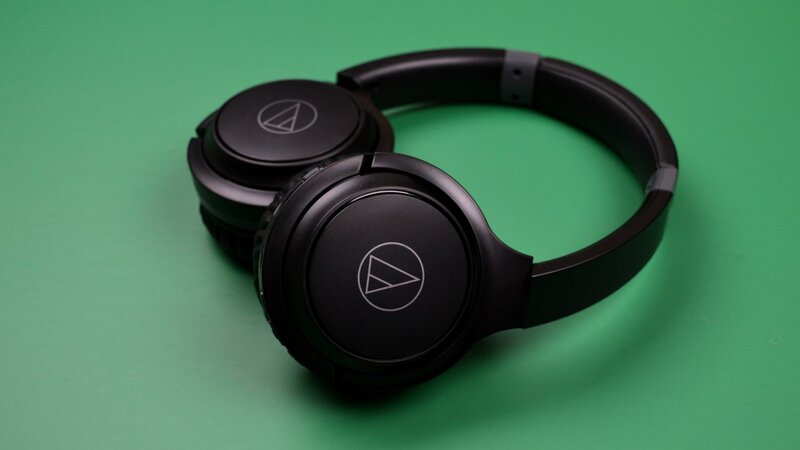 The headphones have the sleek black with gray accents that Audio Technica has become known for, helping make the headphones look a whole lot more expensive than they actually are. The headphones actually come in three colors — so if you don’t like the black look, you can go for a white, or gray with blue accents. As you might expect, the Audio Technica ATH-S200BT are largely made from plastic, and while that does give them a slightly cheap feel, the fact is that the headphones use metal were it really matters. Extend the ear cups a little, for example, and you’ll find that the headband is made from metal, meaning that it’s unlikely it’ll break. While the left ear cup doesn’t have anything in the way of controls or ports, the right does — on it you’ll find a power switch, volume and playback controls, and a MicroUSB charging port. Notably missing is an aux port for wired use — so if you run out of batteries you’ll be pretty much out of luck. In the box, apart from the headphones themselves, you’ll only find a MicroUSB cable. There’s no carry bag or other extra accessories to be found here, so don’t expect them. The headphones may use cheaper materials for some aspects of their build, but thankfully that doesn’t mean that they’re too uncomfortable — though they’re not absolutely perfect either. The clamp of the headphones is quite tight, meaning that over long listening periods they can get a little uncomfortable. That, however, may be a blessing for some — these might be great headphones for those looking for a pair of cans to take running or to the gym, provided there isn’t too much sweat involved, considering the fact that these don’t have water resistance of any kind. Still, after using these headphones for a few days we found that we got used to the way they felt, and while a looser clamp may be helpful for some daily listening, it’s certainly not to the point of being a dealbreaker here. We found that despite the clamp, and the fact that the foam probably isn’t the highest-quality memory foam out there, the headphones remained relatively comfortable on both the ears and under the headband. The design and comfort may be important enough, but ultimately it’s sound quality that trumps all — and when it comes to budget headphones, sound quality can be a little hit and miss. In classic Audio Technica fashion, however, these headphones still sound quite good. For starters, the bass response strong and powerful, with kick drums seriously punching through a mix, and bass tones coming in smooth and heavy. The headphones certainly offer a bass-forward approach — so while most consumers will like that, those looking for ultra-natural headphones may want to look elsewhere. The mid range is quite tuned, but that’s not necessarily a bad thing. In general, the headphones seem to have a warm tone, thanks in large to a boost in the low mids. On top of that, the headphones also seem to have cut high mids, giving meaning that vocals and guitars feel slightly laid back. The high end is relatively detailed, but more of it would have been nice. It’s not overly cut — but bringing it forward a little would help make music a little more exciting. Still, it’s a small complaint for a pair of headphones this price — and none of that is to say that the headphones aren’t at least competent in the high end department. The Audio Technica ATH-S200BT headphones connect to your listening device through Bluetooth 4.1, which means they’ll offer a listening range of 10 meters, or 33 feet. We didn’t really experience any skips or jumps, apart from at unreasonable distances and with a number of obstacles. Where these headphones really shine, however, is in their battery life. The Audio Technica ATH-S200BT headphones have a battery life of a whopping 40 hours, which is far better than the vast majority of wireless headphones out there — even headphones five times as expensive as these. That’s great news for those that don’t want to worry about charging their headphones very often. The Audio Technica ATH-S200BT headphones are a winner in their price range. They’re perhaps not as full-featured or detailed as the company’s more expensive cans — but no one would expect them to be anyway. In fact, we really don’t think there’s a better option in this price range, especially considering the absolutely massive battery life. If you’re looking for the best wireless on-ear headphones you can find under $70, then the Audio Technica ATH-S200BT headphones are the way to go. Because of their excellent value for money, we’ve decided to award the Audio Technica ATH-S200BT headphones the Headphone Review Silver Medal.